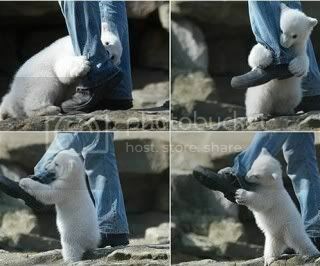 These are pictures of an actual Polar Bear attack in Churchhill. These pictures were taken while people watched and could do nothing to stop the attack. That is just too gruesome! I wonder why nobody shot that bear before it could chew on those levi's. It's a wonder the photagrapher did'nt get mauled too! Ima I'ma bite this GRAWLL! Hey stay still you! Growl! !